Antarctica is losing so much mass that it’s actually changing Earth’s gravity. Antarctica is famously a continent capped with ice, but as Earth’s climate changes and the polar regions get warmer, its ancient ice is beginning to melt. The immediate consequence of the melting is the growing instability of ice shelves, places where the ice covering extends into the ocean. However, if we really want to know how quickly Antarctica is losing ice, we need a way of measuring that loss in terms of total mass.In that mission, scientists are aided by gravity. As Antarctic ice melts, it shifts mass from the continent into the oceans, slightly changing Earth’s gravitational field in that part of the world. We wouldn’t notice it, but orbiting observatories like the Gravity Field and Steady State Ocean Circulation Explorer (GOCE, which is more an abbreviation than acronym) can measure small fluctuations in gravity compared with other spots on our planet.Data from GOCE and the twin Gravity Recovery and Climate Experiment (GRACE) probes show that Antarctica is losing ice at a scary rate, as reported in Geophysical Research Letters. Between 2009 and 2012, the years for which GOCE was taking data, the amount of gravity in Antarctica decreased noticeably, corresponding to a lot of ice melt.From the point of view of artificial satellites or the Moon, Earth’s gravity is mostly a steady influence, a tug that doesn’t particularly depend on where the satellite is over Earth’s surface. However, mass is the source of gravity, so if the crust is thicker in one place than another—say, the Himalayas vs. the floor of the Atlantic Ocean—the thicker part will exert a slightly higher gravitational pull. The West Antarctic ice sheets are particularly of concern: if they melt completely, just that water alone will raise global sea levels by a dangerous amount. As a result, a satellite passing over a higher-mass region would speed up very slightly, and slow down over a lower-mass one. Gravitational fluctuations from place to place over the whole Earth are represented by a hypothetical map of ocean levels known as the geoid, and it shows a lot about the hidden internal structure of our planet. However, as data from GRACE showed, it’s also possible to map changes in gravity over time. Many geological processes, such as plate tectonics, are too slow for satellites to see, but unfortunately climate change isn’t one of those. GRACE consists of two satellites that chase each other around the planet. By measuring the relative positions and speeds of each satellite, researchers can reconstruct Earth’s gravitational field in both space and time as the probes accelerate. 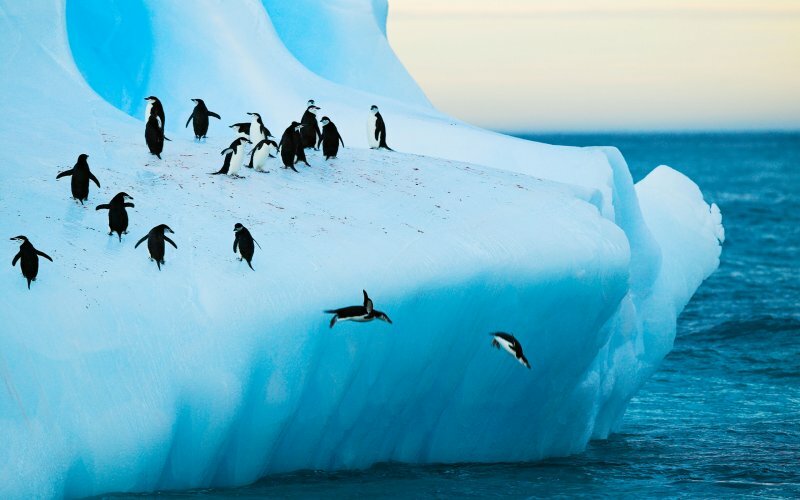 Researchers with GRACE found they could see a noticeable decrease in the gravity from Antarctica even over a span of just a few years. But the probes map the gravitational field along North-South line, which makes the data look stripy. That’s where GOCE comes in: that satellite had three acceleration meters that let it take gravitational measurements in all directions. While GOCE by itself isn’t good enough to measure fluctuations due to ice melting, the combination of GOCE and GRACE eliminates the shortcomings of both. To paraphrase the renegade philosopher Hannibal, I love it when science comes together. How much is a lot? The authors of the new paper looked at GOCE and GRACE data for three Antarctic glaciers, and found they are losing approximately 185 billion metric tons (204 billion US tons) of ice each year for the three years of the study. For comparison, all the humans put together weigh approximately 287 million metric tons (316 million US tons)—each of the three glaciers loses more ice mass than the combined weight of humanity. As someone who researched gravity in graduate school (though more things like black holes than the Earth geoid), I find the fact that we can measure ice loss using gravitational satellites really fascinating even as I’m disturbed by what we discover. But that’s exactly why we do science of this kind: we have to understand the magnitude of the problem. Just as science is a shared endeavor that benefits all of us, climate change will damage all of us — and it will take all of us working together to make sure satellites like GOCE and GRACE aren’t just measuring the magnitude of disaster.